The Swiss brand with a Latin soul, Cuervo Y Sobrinos excels in bringing its history to life in its watches. Once again this year, the brand revives a landmark model from its past. 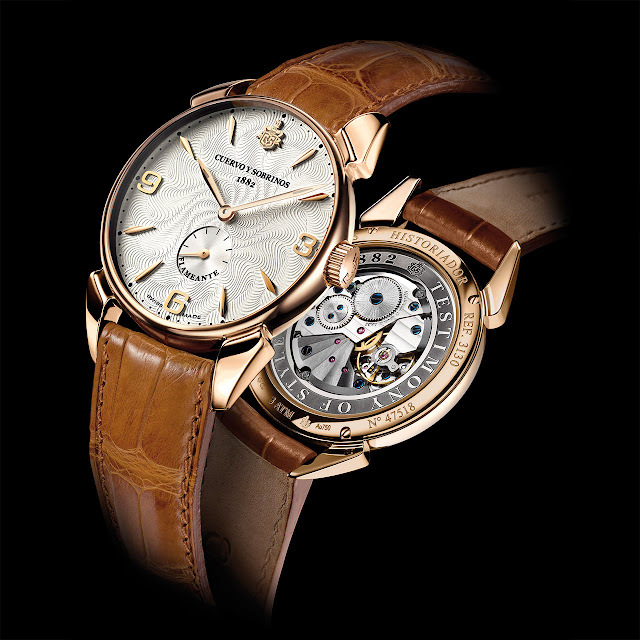 The Historiador Flameante pays tribute to a 1950s watch. Flameante or flaming like the finely guilloché dial and movement finishes: the Côtes de Genève pattern on the plate, the blued screws, and the "Testimony of Style since 1882" inscription engraved around the movement, all visible through the sapphire crystal back. The hand-wound calibre, with small seconds offset at 6 o'clock, is housed inside a rose gold case whose 40 millimetre diameter is both classic and universally pleasing. Cuervo Y Sobrinos again transports its history into the 21st century and, today as yesterday, proves it is an accomplished advocate of refinement and elegance.